An entire sold-out arena celebrated Roy Hibbert‘s 27th birthday Wednesday night. A number of Indiana Pacers players spent their off night at Justin Timberlake‘s concert at Bankers Life Fieldhouse, and JT, knowing that Hibbert was in attendance, led the audience in wishing the big man a happy birthday. 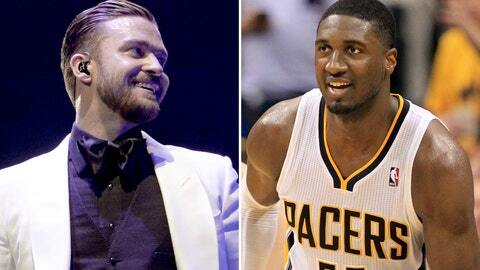 Timberlake became somewhat of an honorary Pacer this week. The pop star was on hand to see Indiana take down the Heat in a battle of the East’s two best teams on Tuesday, stuck around to play a little HORSE with Pacers star Paul George afterward and hung out with Hibbert and the guys backstage after his show. He certainly could have picked worse teams to support. At 19-3, the Pacers hold the best record in the NBA and already seem like a near lock to meet the Heat in the Eastern Conference finals. Hear the Timberlake faithful wish Hibbert a happy birthday in the video below, courtesy of Pacers swingman Rasual Butler.